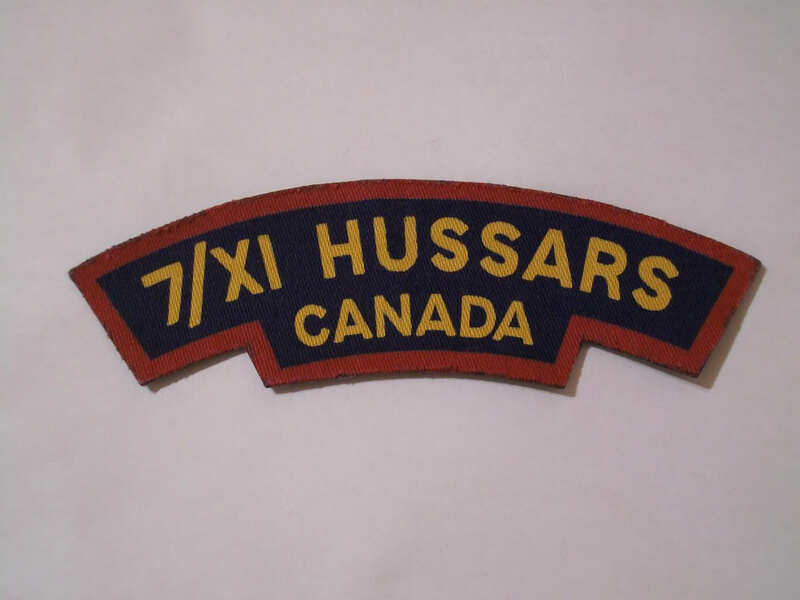 7/IX Hussars flashes post war or not? 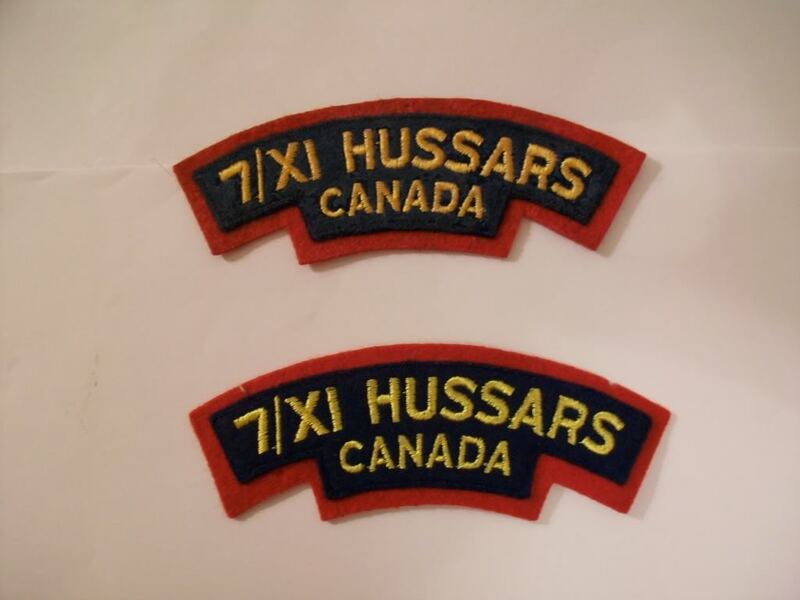 I just picked up these two 7/IX Hussars flashes to add to my Eastern townships Militira collection. On is pristine the other has faded some. My real question is are they genuine, and are they post war or wartime flashes? 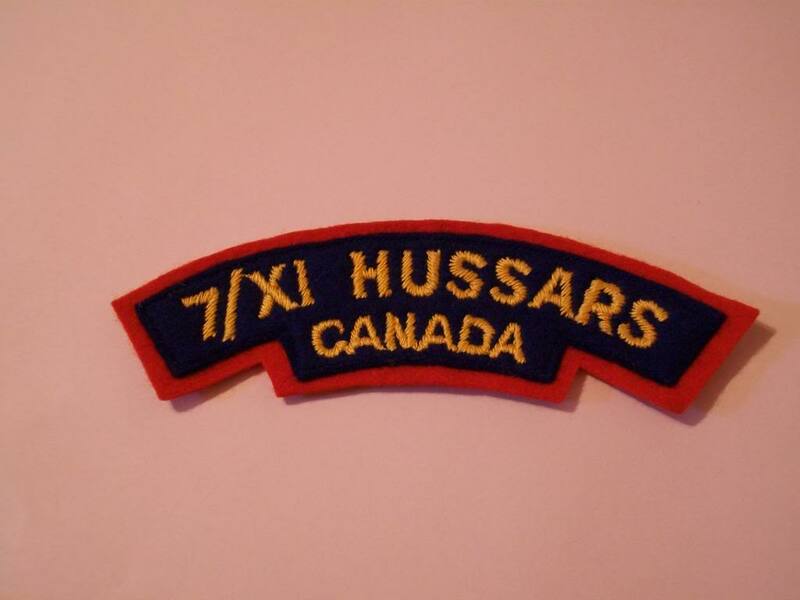 Re: 7/IX Hussars flashes post war or not? Hi, Titles appear to be post war Canadian made patterns. I'm no expert on Flashes, how do you tell if these are post war? 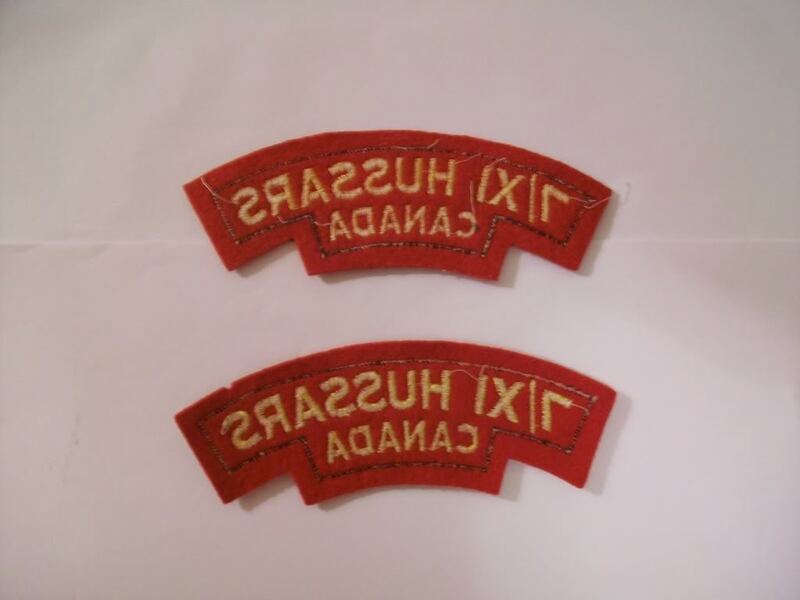 Also is there any reference material to help with identifying canadian shoulder flashes? The embroidery is typical of Canadian manufacture, as is the construction method. Two layers of cloth with the embroidery through both layers. The material appears to be melton and not felt. In addition, the number of Second World War titles for the regiment is quite small, as it was only a squadron in size. That makes the number of titles for the SWW quite small. Not much for reference on Canadian shoulder flashes, but hopefully there will be in the future. Note, Mike's example is three layers plus embroidery. The slanted (bias) embroidery is attributed to British made titles. Interesting, someone should put together a referance book on Canadian flashes. Anybody have any thoughts on this title that just poped up on ebay? good title...way too much money in my opinion.. Anybody have a canvas 7/11 hussars flash? If so could you post some pics for reference. From the British Badge Forum. Any photos of the backing? Hello Lorne, the backing of late war runs of printed titles is a thin black cotton layer. The 7/11 only had the late war pattern printed titles. I just picked this one up, its printed and has the black backing you talked about. No problems with that title. Great acquisition! Ya I was pretty happy when i found it, they don't seem to be very common. It will go nice with my post war set of 7\11 hussars flashes. I just recieved this 7/11 title today in the mail. It seems to match the title Michael posted earlier in this thread. I assume its british made, does any one else have any thoughts on this? yes there are lot on these kind of Linen back(for lack of another term) types but as Bill says there are examples(especially for Arty units if I remember correctly) that did not go over.....they would initially seem like Brit made to me but the existence of home unit examples may mean they were made in North America. I can say that I have purchased many of this type (unissued)in the United States for some reason, making me a little suspicious that they may actually be American made. I have been looking at some American div patches lately to try and find consistency in the style....this is,of course just a theory at this point and should not be considered as anything but speculation or a possibility....Certain dealers in the States claim that these are Crestcraft (Winnipeg) made but I have yet to see any proof of that....they are still a mystery..
Hi Mike, The Crestcraft company is not listed in any of the contracts that I have seen to date for making Canadian army insignia. (I am up to the late 1940's in the write-up. Though manufacturers are sometimes mentioned, no mention of Cc.) The were contracted to make a lot of unofficial patches and crests, but I have never heard of them being associated with a run of shoulder titles. Interesting, although I did buy this title from a collector in England this certinly doesn't mean it was manufactured there. Heres a photo I came across on the net of a BD with what I believe is this pattern of title on it. Of course this BD might not be legit, I'm far from an expert on this subject. Good to know Bill,and as I suspected.....not sure where that speculation came from but perhaps it started in an imaginary Dutch town..:) These titles have been around for a long time,however little seems to be known about their origins. Have you ever encountered them on BD's Bill? Hi Lorne, That tunic was discussed somewhere earlier, maybe on a Facebook page? 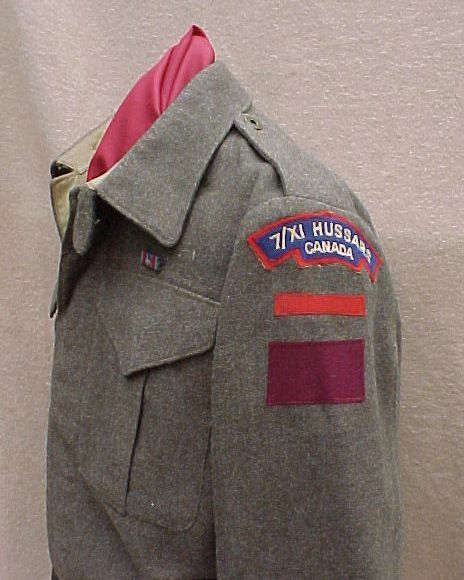 It may be an authentic tunic but the 7/11th had been officially disbanded in January of 1943. 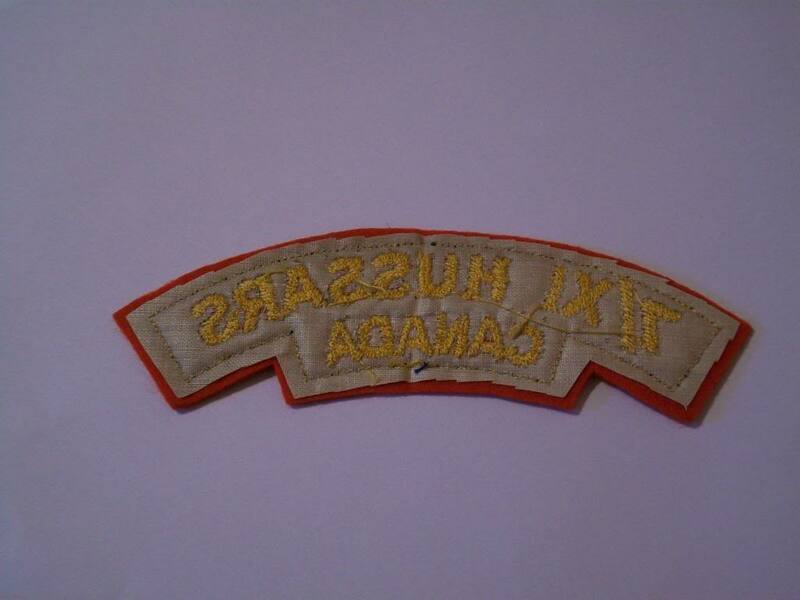 The HQ Sqn 5 CAB was supposed to wear the corps title, Canadian Armoured Corps and the plain 5 CAD patch, and the brigade bar. As shown above, except the 7/11th title would be the Canadian Armoured Corps. To complicate the situation even further the 7/11th title was contracted in printed pattern, even though the regiment had been disbanded, and there were no original members of the 7/11th on the establishment of the HQ Sqn. Sorry Mike, writing while you posted. Clarification, you mean Cc shoulder titles on uniforms? Not sure I could positively id a shoulder title on a uniform as Cc without having a good look at the back.